The monopoly position of laser procedures and polychromatic light in the form of pulsed flashlamps (IPL) is increasingly fragile. In many treatment centers has been a change in our completed towards the radio wave method. Due to the very good results and the collagen specificity of the radio wave, the fractional ablative and were compared non-ablative laser systems with the fractional RF system. By fractional radiofrequency application could be in 121 patients achieve good results with respect rhytidectomy and repair of acne scars and stretch marks. This minimally invasive procedure has a very short downtime and can be easily combined with other procedures such as autologous fat, hyaluronic acid, Radiesse and fractional laser systems. For several years now notice how constantly establish new physical methods in the field of minimally invasive surgery and dermatology. The former monopoly of laser procedures and polychromatic light in the form of pulsed flashlamps (IPL) device thereby increasingly falter! In analogy to Endolaser versus VNUS Closure almost or laser lipolysis versus Invasix-BodyTite already a transformation has taken place towards the radio wave method in the treatment centers. Because of their success and the collagen specificity of radio wave tried the fractional ablative and was to compare non-ablative laser systems with the fractional RF-lifting. Within 11 months 121 patients were treated with fractionated RF. Of 65 with sagging facial skin, 16 patients distensae with striae, 15 with hypertrophic scars and 25 with acne scars. Of these, 98 women and 23 men. All procedures were performed on an outpatient basis under local anesthesia with lidocaine topical in all cases at least 30 minutes. was applied occlusive. In 68 cases, local blocks were set additionally sedoanalgesia the face yet. The stretch marks in the abdominal region were treated to a liposuction in tumescent local anesthesia in connection. Very often the facial treatments were combined with preoperative Botox treatment (14 days) and with Volumenaugmentation (autologous fat FAMI, hyaluronic acid and Radiesse). The Volumenaugmentation made immediately after the intracel therapy. The minimally invasive fractional RF with microneedles is used in East Asian countries since about 1 year. It is given a RF energy via microneedles in the reticular dermis. The needles are isolated in its shaft, only the tips give after introduction into a certain depth (0,5-0,8-1,5- 2.0mm) energy to the adjacent needles, so that creates a horizontal pattern of damage The exposure energy can be varied in a plurality of energy levels, whereby it is opportune to apply at the surface of weaker energies. After having "cold" needles the basement membrane is penetrated, it can be assumed that this treatment there is no scarring and pigment changes. Histologically, coagulation zones were confirmed in depth in their confluence by the bipolar application. Inland 70 days, there was an almost complete repair of the damage by means of regeneration of collagen and Tropoe-lastin. In this context, the firming, wrinkle reducing, and scar remodeling effect by this new collagen and elastin synthesis is described. This period of regeneration also requires the two-month treatment cycles of fractional RF treatment. From these studies, one can clearly verify a significant impact in terms of streamlining the cheeks, and in particular the dermis, but also radiating from the depths retinacula and the fat cells limiting fibrous septa serve as anatomic substrate. In a 41jährigen patient occurred after 2 applications to a significant narrowing of the cheek structure. The resulting in pronation concavity within the meaning of trampoline effect had disappeared after two treatments. The resultant years ago by CO2 Resurfacing laxity of cheek skin was significantly improved after three Intracel application. A resulting after several births and stressful situations deflation with ptosis of the entire skin of the cheek was by a FAMI-engagement (autologous fat) and two-time intracel treatment significantly improved. Acne scars can be changed simultaneously with both the deep Intracel application as well as the surface area fractional laser application. A coverage of 20% Man shall not exceed this. This is true both for the non-invasive erbium glass and for the invasive C02 fractional system. Fractional RF application brings certainly a significant reconstruction process in the dermis without the epidermis and basement membrane to the injured. Therefore, a scar-free application is guaranteed. By focal formation of collagen and elastin, both a tightening induced, in addition, the scars and striae of Bindegewebsqualität be optimized. A combination with a superficial fractional laser resurfacing is quite possible, which could be demonstrated by studies in resected Abdominoplastikhäuten .. Thus, the parameters obtained can be used in many combined facials. In addition to these fractional bipolar RF treatment for quite some time are also monopolar, deeper applications available, in particular tightening measures on the trunk and extremities should be induced! These dermal applications are likely to have effects on sebaceous and sweat glands and blood vessels (telangiectasia), although there are still missing results and correct parameters. Overall, we are the fractional RF application views in hopeful therapeutic options for aesthetic as well as curative Dermatology. The method is minimally invasive, has in mind the modern aesthetic demands a downtime of only 1 to 2 days (weekend procedure). 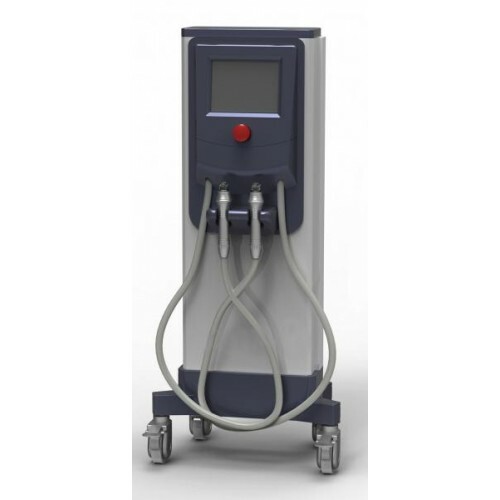 As a confirmation of the effectiveness may be noted that already find in Korea more than 400 units of this system in the dermatological and aesthetic practices its application. By fractional radiofrequency application in dermal layers can be achieved with respect rhytidectomy and repair of acne scars and stretch marks excellent results. This minimally invasive procedure has a very short downtime (few side effects is) and can easily be combined with other methods. These are own fat, hyaluronic acid, Radiesse and fractional laser systems. Other dermal structures such as sebaceous and sweat glands, but also vessels (telangiectasia) appear to represent a target for this method.